Goat's fat and wild venison, plus sides of ancient wheat and bracken. It's not a menu likely to appear on Masterchef, but for some of our ancestors it was a nutritious feast. 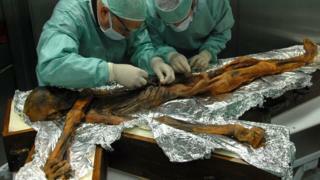 Scientists have revealed that the last supper of Oetzi the Iceman was well-balanced but also alarmingly high in fat. What does this say about the diet of our ancestors? "Considering that there was no salt also, the pure taste of this meat, this fat - of all these components - I think it's hardly edible." Although the Iceman did not have to contend with processed food, there was a negative side to his diet. He already had signs of blocked arteries at the time of his death. He may have died in battle, as he had several wounds to his body and was carrying weapons, including a copper axe. Was Iceman taking herbal medicine? He may also have been dosing himself with herbal medicine, as the researchers found traces of bracken, a type of fern, in his stomach. Alternatively, he may have wrapped his food up in fern leaves and ingested the toxic spores by mistake. The wild meat may have been eaten fresh or perhaps dried.